We’d love your help. Let us know what’s wrong with this preview of My Mantelpiece by Carolyn Goodman. To ask other readers questions about My Mantelpiece, please sign up. I thought this book was excellent. Has anyone else read it yet? "So there's a responsibility on every one of us and you can't walk out of it... The question is not whether Andrew Goodman is dead; the question is whether we are dead or whether through his life and death we come alive." A moving memoir for a remarkable life. Carolyn Goodman gave so much to a world that took so much from her, and her reflections, memories, and tender words shared in this volume near the end of her life are hopeful and heart-expanding. "Tonight there are people all over the world... who might be facing difficult decisions -- perhaps choosing between what's easy and what's right. If the decision is the path that is more unpopular, perhaps more dangerous, but more just... in those moments, Carolyn Goodman lives." Subtle, intricate, brave, and instructive. Carolyn Goodman was raised by emotionally distant parents, and endured many tragedies, but ultimately, this is a story of personal growth and survival. When she was a child, her older brother died, and her parents never thought to speak with her about the incident. Basically, no one spoke of anything in her house. it took until half way through the book before I realized that she had two younger siblings! For all the ways that her parents did not support her when she was growing up, she tried to Carolyn Goodman was raised by emotionally distant parents, and endured many tragedies, but ultimately, this is a story of personal growth and survival. When she was a child, her older brother died, and her parents never thought to speak with her about the incident. Basically, no one spoke of anything in her house. it took until half way through the book before I realized that she had two younger siblings! For all the ways that her parents did not support her when she was growing up, she tried to do the opposite of that when she had her three children, always encouraging them in whatever they wanted to do. She felt that encouragement allowed her 3 boys to grow up to be men with their own ideas. Her middle son always fought for what was right and because that was the type of person he was, she couldn't tell him not to go down to Mississippi in 1964 to help register Black voters. He was killed there and she learned to move forward despite her heartache. The book showed her love for her husband; the pages interspersed with poems he wrote to her and their children. The memoir of a Mother of a slain Civil Rights worker and written by a family friend, Brad Herzog, it is a moving tribute to a person and a movement. I learned more about the US civil rights scene of the 60s and much, much more about the dedication of not only the three slain young men, but also the work that Carolyn Goodman and her husband did their whole adult lives. This book makes you take stock of your life. Fairly quick read. MY MANTELPIECE is a powerful testament to the power of story-based resources in teaching history. 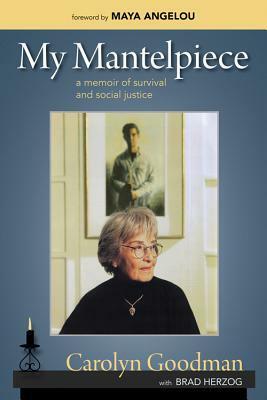 Carolyn Goodman, mother of civil rights worker Andrew Goodman slain in Mississippi during Freedom Summer 1964, reveals her life of heartbreaks and joys, challenges and gifts with stunning candor and insight. This book is an autobiography about the activist Carolyn Goodman whose son Andrew Goodmand was one of the white men killed in the Freedom Summer by the KKK for trying to help. Carolyn recently passed away, so the book is put together by another writer. If anything, I wish there was more about her life and struggles. A remarkable woman and very quick read. While I did not find the book particularly well-written, this memoir is an important story. Carolyn's son was murdered by Klansman during the civil rights movement in the 60's and she continued his work throughout her life. Highly recommend this one.